Needless to say American business isn't doing so hot. We've felt it in our house (not sure if you've heard but graduate students + architecture + Providence, RI don't = $). Nick and I have done a lot to cut back (good bye cable TV, I'll miss you!) but one of the nicest, and most surprising things is that we both have gravitated to learning more about Zen studies, in an effort to accept what is to come! 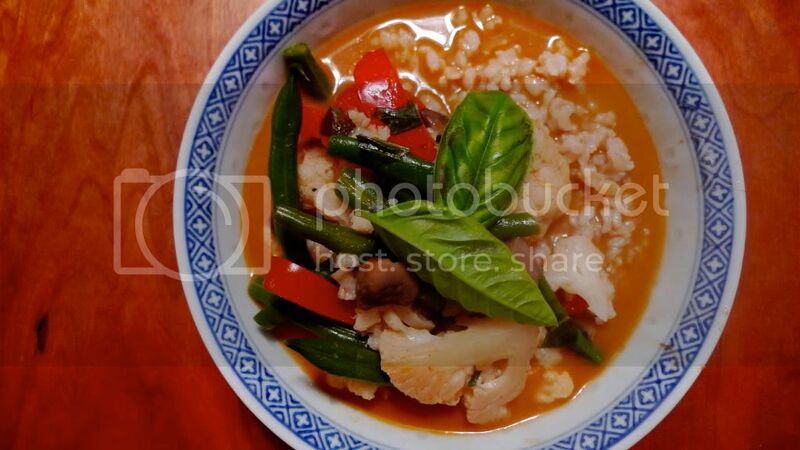 This Vegetables in Thai Red Curry recipe is adapted from Tassajara Dinners & Desserts by Dale & Melissa Kent. It's a quick cook, super delicious and nutritious, and only costs about $10 to make ($2.50 a person!). Swap out the veggies specified here with whatever you have around and need to use up, or whatever looks best at the market. "Get a taste of mindful cooking, and eating, the Tassajara way. At the oldest Zen training monastery in the United States, even food preparation is transformed into a spiritual practice. For decades guests have flocked to the Tassajara Zen Mountain Center in California for its meditative cooking classes and retreats. 'Mindfulness is a big part of what goes on in the kitchen,' explains Dale Kent, former tenzo (head of the kitchen). 'We encourage people to be in their bodies-to feel the knife in their hands or how they're holding a carrot,' he explains." 1. Blanch the cauliflower 4 minutes, or until al dente, in pot of boiling, salted water. Remove with strainer, rinse under cold water to stop cooking. Repeat with green beans in same pot, set aside. 2. Heat oil in skillet over medium heat, combine coconut milk, curry paste, sugar, tamari, and 1/2 cup water. Start with small amount of curry paste and adjust for spiciness (remember you'll eat the sauce with rice & veggies). Add cauliflower, green beans, mushrooms, bell pepper, and half of basil. Simmer 10 minutes. Garnish with remaining basil. I made some brown rice to go with this as I'm a sucker for a bowl full of rice, drowning in creamy, vibrant, curry. The leftovers are just as good, if not better! Looks DELICIOUS. Do you deliver to Cambridge? How funny! This past weekend I curled up with the Tassajara Picnics & Appetizers book, loved it, and want to see more of their books! This looks delicious, and I'm with you, I love curry-soaked rice. Normally I find DIY curries lack a little something...but this recipe is delish! (Maybe the soy sauce makes the difference.) Thanks as always, Two Blue Lemons. I'm so glad you ladies enjoyed this dish! How can anyone resist those "eat me I'm good" colors?! Enjoy!